In South Korea, it has become a trend to celebrate Halloween. In the past, Halloween was just another foreign holiday for Koreans. Nowadays, when we go out to Itaewon or Hongdae on Halloween, we can easily see young people in Halloween costumes with special makeup. Halloween first started in the West. While living in America, I came across many people making their own costumes for Halloween. Some interesting costumes that I saw were a man wearing a tiny tiger-print loincloth like Tarzan and a man dressed like Cardcaptor Sakura. Before, I had no idea where the custom comes from and why young people dressed up for Halloween. After moving to the US on an exchange program, I realized how fun the custom is. An “Effortful playing” is a good way to describe the way the American’s unwind during Halloween. In my opinion, the difference in culture, such as recognized forms of leisure, different kinds of housing, and accessibility to entertainment, influence how young people have fun. 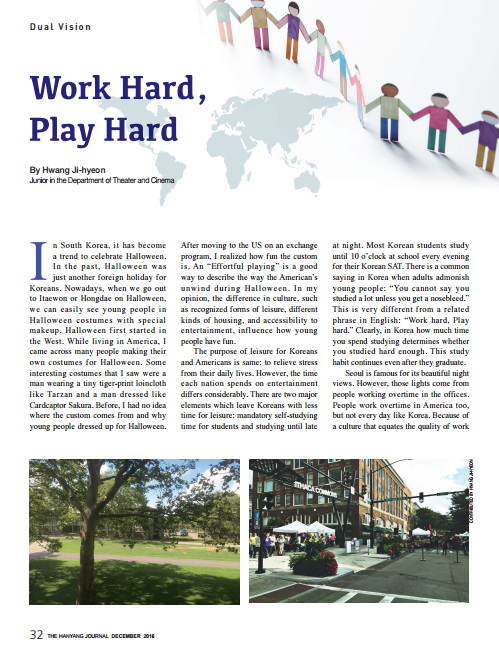 The purpose of leisure for Koreans and Americans is same: to relieve stress from their daily lives. However, the time each nation spends on entertainment differs considerably. There are two major elements which leave Koreans with less time for leisure: mandatory self-studying time for students and studying until late at night. Most Korean students study until 10 o’clock at school every evening for their Korean SAT. There is a common saying in Korea when adults admonish young people: “You cannot say you studied a lot unless you get a nosebleed.” This is very different from a related phrase in English: “Work hard, Play hard.” Clearly, in Korea how much time you spend studying determines whether you studied hard enough. This study habit continues even after they graduate. Seoul is famous for its beautiful night views. However, those lights come from people working overtime in the offices. People work overtime in America too, but not every day like Korea. Because of a culture that equates the quality of work with the time spent working, Koreans are always short on time. It leaves them with little time to relax and in order to relax they go downtown to drink, dance, or sing karaoke. They spend their leisure time outside the home and that costs money. In other words, they buy the opportunity to have fun. They do not put efforts into improving the qualities of their leisure activities. However, the unique culture of fun in America is embodied by house parties. It is very common to spend time hanging out at a friend’s house party. The organization of the house party depends on the owner of the house. However, it is common to have one area for dancing and another for socializing. A house has everything needed for having fun. It is like a combination of a dance club and a pub. I was surprised by how an ordinary house could become an exciting party venue. In the dance area, there was DJ equipment and big speakers. Walls were lit up by fluorescent paint. The host prepares fluorescent bracelets and hands them out to people at the entrance. When people attend a house party, they rush to the dance floor with a glass of beer or punch. When they get thirsty, they help themselves to alcohol or other drinks from a large bucket on a table near the dance floor. After dancing for a couple of hours, they move to another room or go outside to chat with their drinks in hand. As the party draws to a close, they either go home or stay over and sleep. Americans party in the same house where they live, and the atmosphere changes when they have a gathering. The first time I went to a house party, I could not help but wonder: “How did they prepare this? Why did they put so much effort in having a party in a house?” and “Who will clean up the mess?” I was the only one worrying about these things. There are several reasons for this difference. First, accessibility determines the venue for leisure activities. In America, there are universities in urban areas, but it is common for schools to be located far from the center of a town unless, of course, you live in a city like New York. Students have to take a bus or ask friends to give them a ride to go to a party or to go downtown. In Korea, there are “college streets” that are packed with pubs, restaurants, and karaoke rooms. They can go there on foot. On the other hand, in America, you need a car to go out. Second is an early separation from one’s parents. Most Americans who graduated from high school break away from their parents both physically and financially. 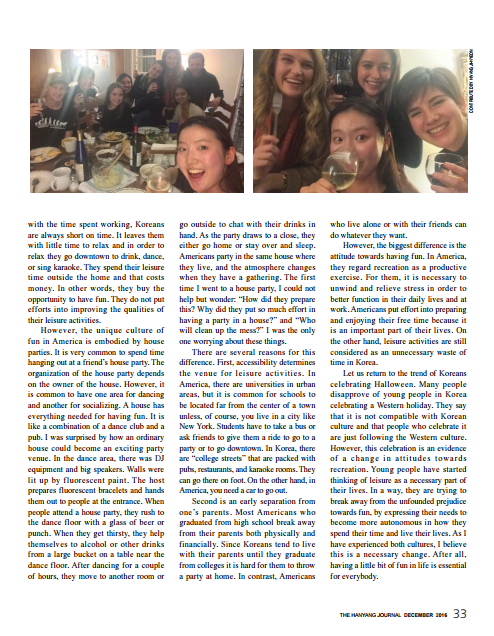 Since Koreans tend to live with their parents until they graduate from colleges it is hard for them to throw a party at home. In contrast, Americans who live alone or with their friends can do whatever they want. However, the biggest difference is the attitude towards having fun. In America, they regard recreation as a productive exercise. For them, it is necessary to unwind and relieve stress in order to better function in their daily lives and at work. Americans put effort into preparing and enjoying their free time because it is an important part of their lives. On the other hand, leisure activities are still considered as an unnecessary waste of time in Korea. Let us return to the trend of Koreans celebrating Halloween. Many people disapprove of young people in Korea celebrating a Western holiday. They say that it is not compatible with Korean culture and that people who celebrate it are just following the Western culture. However, this celebration is an evidence of a change in attitudes towards recreation. Young people have started thinking of leisure as a necessary part of their lives. In a way, they are trying to break away from the unfounded prejudice towards fun, by expressing their needs to become more autonomous in how they spend their time and live their lives. As I have experienced both cultures, I believe this is a necessary change. After all, having a little bit of fun in life is essential for everybody.